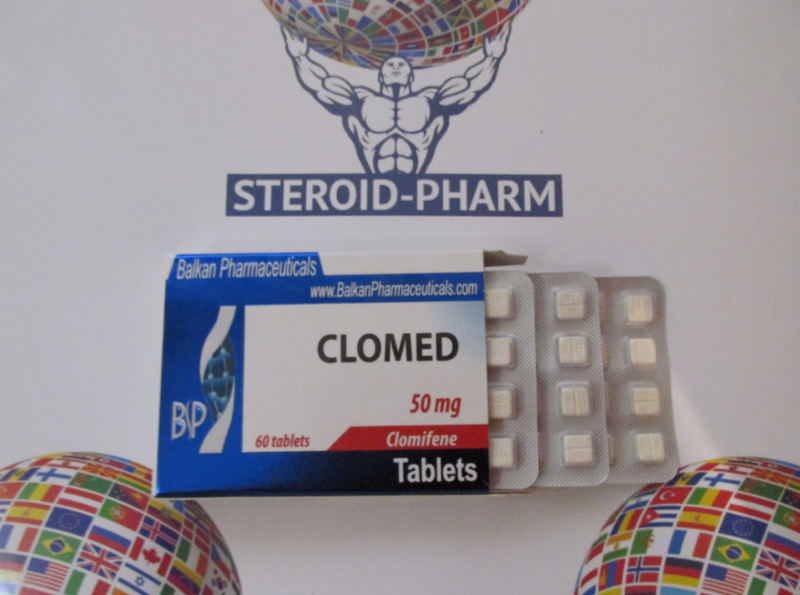 Clomed is referred to anti-estrogens medicaments, because it blocks estrogens that arise from aromatization.It is always used as a stimulant for the production of own testosterone in human organism. By its antiestrogenic properties this preparation is weaker than such other drugs as Nolvadex or Proviron. When taking Clomed the level of testosterone is normalized within 10-14 days. When taking the drug, muscle mass and physical strength increases, the body fat content decreases and sexual function becomes better. Very rarely a visual impairment can occur, expressed in the vagueness of the image.In this case you have to immediately stop taking Clomed. The violations of the liver work can occur too but in very rare cases. Women are at an increased risk of a multi-egg pregnancy, ovaries can increase, that may be accompanied by pain in the abdomen. Clomid inhibits the negative effect of steroids on the sportsman’s body. It also does not have gestagenic and androgenic activity. The drug stimulates an increase in the number of follicle-stimulating and luteinizing hormone in the blood, as a result - an increase in the level of endogenous testosterone and an increase of the steroids effectiveness. Why it is necessary to take gonadotropin during the course? Many people know that after the androgenic course it is necessary to restore the functions of the genital organs by the chorionic gonadotropin taking. It happens because of the fact, that change in the concentration of the hormone in the blood leads to a change in the activity of the hypothalamus, which secretes the liberins. This modifies the synthesis of the tropic hormone of the pituitary gland, and the activity of the corresponding peripheral gland. Increased concentration in the blood of the hormone leads to a decrease or even a blockade of regulatory hormones secretion. Modern anabolics have considerable similarity with testosterone and while getting into the body block the activity of the entire system. At the same time, the production of gonadotropins, gonadoliberins and own testosterone decreases. To prevent this effect, it is necessary to take gonadotropin during the course. Clomed immediately acts on estrogen receptors and blocks them. It acts as an antagonist of estrogens by eliminating their inhibitory effect on the pituitary and hypothalamus, providing a faster recovery of their functions. Dosage of Clomed taking is equal to 50-100 mg (1-2 tablets) per day after taking a meal. The duration of course is 10-14 days. It is recommended to start with 100 mg per day, taking 50 mg after meals in the morning, and 50 mg in the evening. On the 5th day of taking the drug the dose is recommended to be reduced to 1 tablet per day. It is not recommend taking the drug for more than 10-14 days. With this drug is good to take such boosters of testosterone as, for example, Tribulus. In case of drying it is useful to take such fat burners as, for example, Clenbuterol. 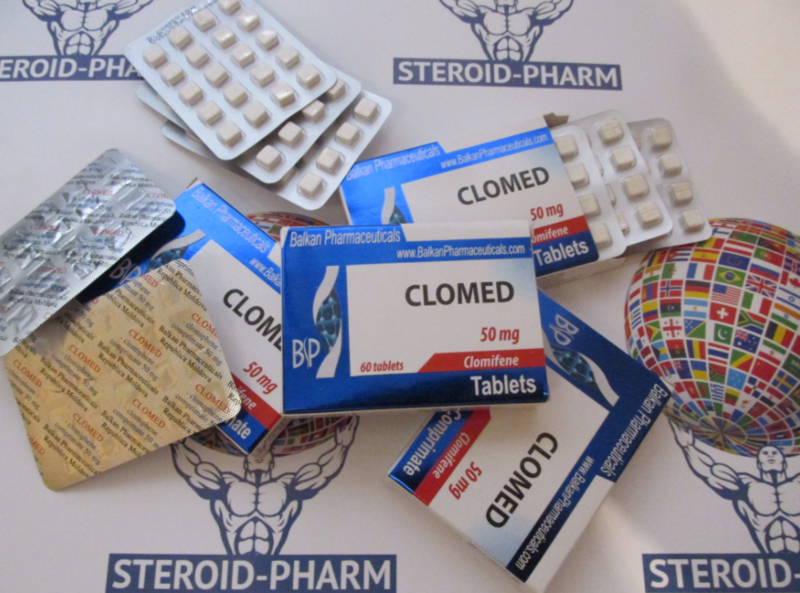 Buying Clomed at our online store you can really quickly and effectively restore your body after taking a course of steroids. In this case, your appearance will remain the same while the condition of your health will become much better.